Price: $24.99 (for all the Modules); you are also able to purchase each module separately($4.99). In my opinion this app is undervalued as it offers so much for only $24.99. As you can see this app has received 14 5 star reviews!!! Impressive. I see also 3 “one star” reviews here. Given the fact that I have played with the app, there are only two explanations for these reviews, as the people who wrote these reviews did not even explain themselves as to “WHY in the world did you give this app ONE STAR!?”. First possibility: these are jealous app developers with fake one start ( believe me, this has happened a lot), or someone who purchased the app without reading what it is for. I only have access to the basic Module that comes with you purchase the app for $4.99, so I cannot give any review on the other specific modules at this point. 1. Create a profile for your student. The level of play depends on whether you have a group setting or 1 on 1 and the length of the conversation practice you want to have. 3. 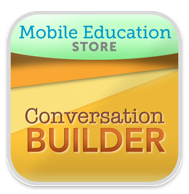 Choose the Conversation Initiator: This is BRILLIANT! You have the option of having either the student or the peer ( which in the case is “you” or the “iPad”) initiate the conversation. 4. Select the module to play. 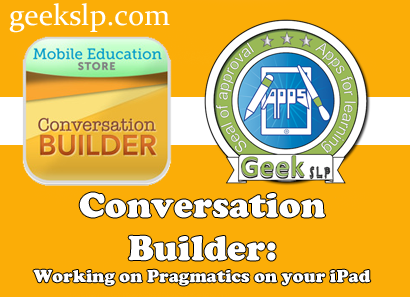 In response to an outstanding app quality and value, Conversation Builder deserves the GeekSLP Apps for Learning Approval Seal. Click here to see a list of all apps that have received the Seal.